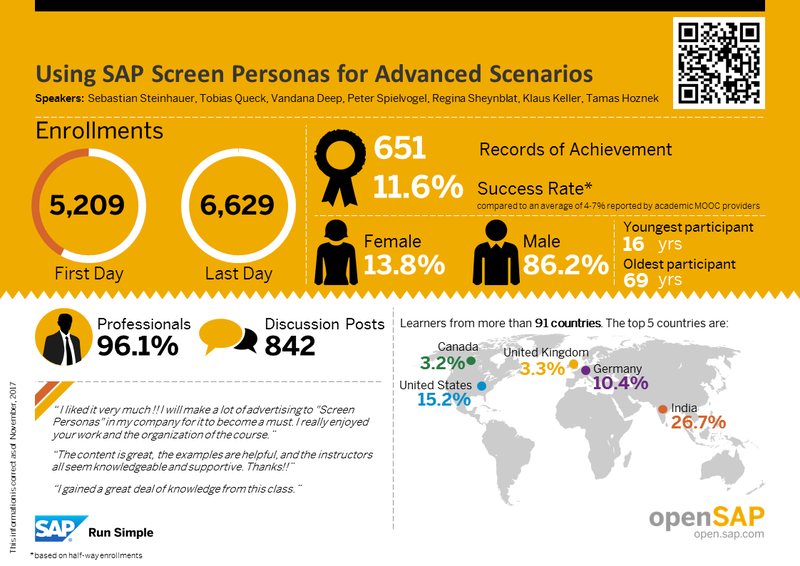 Thank you to the 6000+ people that signed up for the openSAP course, Using SAP Screen Personas for Advanced Scenarios! With the conclusion of the peer-graded final assignment and the distribution of final grades, the course is now complete. If you missed it, the content is still available in self-paced mode. Using the provided training system, learners took a deeper dive into the capabilities of SAP Screen Personas. The five-week course expanded on the flavor editing and scripting skills from the introduction course, as well as featured content on system administration and project roll-out. Productivity Power Play is a biweekly video series aimed at providing tips & tricks and product tutorials. The SAP Screen Personas Knowledge Base features walkthroughs, tips, and workarounds submitted by the product team and other users. The Using SAP Screen Personas E-Bite provides a thorough example of an end-to-end SAP Screen Personas implementation, useful for figuring out how to begin your own project. The SAP Screen Personas Practitioner Forum is a monthly call where customers and partners discuss and demonstrate what they are currently doing with SAP Screen Personas. The SAP Screen Personas product team would like to extend its gratitude to Katrin Elk, Michael Pflanz, and the rest of the openSAP team for making it possible to deliver this course. Their support — from initial planning and scheduling, to content creation, to course wrap-up — was critical to the success of Using SAP Screen Personas for Advanced Scenarios. To our learners: thanks for jumping into the course, getting involved, and providing your valuable feedback. We hope you enjoyed getting hands-on time with SAP Screen Personas. Let us know if you need help and feel free to tell us when your project goes live! As a reminder, you can follow the @SAPImagineering Twitter account for up-to-the-minute product updates, tips, tutorials, and event coverage. For the SAP Screen Personas product team, Conrad Bernal. Next What can slow down execution of SAP PI Default Delete Job?